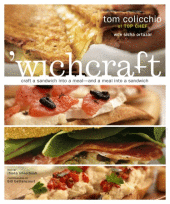 This book - 'wichcraft by Tom Colicchio - is one of our favorite cookbooks. I suppose one reason is because we have always liked watching Tom on the show, "Top Chef". We were pleasantly surprised to find that one of his restaurants was a sandwich restaurant. How cool is that! The cookbook is a compilation of the recipes he uses at the restaurant. Each one makes a simple meal out of a sandwich. The subtitle - Craft a Sandwich into a Meal--And a Meal into a Sandwich - is the perfect motto for us. I for one could eat a sandwich at every meal if it were left up to me. Eggs wrapped in soft buttered toast for breakfast. A peanut butter and strawberry preserve sandwich for lunch. And one of my old-time standbys - a spaghetti sandwich for dinner. I love putting a fork full of spaghetti and sauce on a piece of bread, folding it over and..., well you get the idea. I know the above recipes are not very sophisticated, but in a pinch they work for me. When I want something more exotic and special, I turn to cookbooks like 'wichcraft. It has recipes quite a few steps up from my quick thrown together sandwiches. This is just a small sampling of the sandwich recipes you'll find in Tom's book. I'm sure you'll be the envy of the lunchroom when you take out one of these delectable sandwiches to work. And even if you just want to make something special for your family or just yourself, I'm positive Tom's recipes will make the meal! Would you like your own copy of 'wichcraft by Tom Colicchio? Check out the link at the top right to get your own. It's one of those cookbooks you'll keep referring to over and over, especially if you like Tom Colicchio. Who knows, you may even be able to get it signed at a book signing near you!! And here are the details in case you want to look it up at the library. Looking for more cookbooks? Go from 'wichcraft by Tom Colicchio back to Sandwich Cookbooks to see what you can find.